Another sunny day welcomed us back to Calf Hill for another full day of digging. The main distraction was another visit by the cows. Once they had settled for a snooze, work could continue. The stone feature was cleaned and recorded. The planning frame was used to gain an accurate picture of the stones. Having planned the stone feature, the western half was removed. 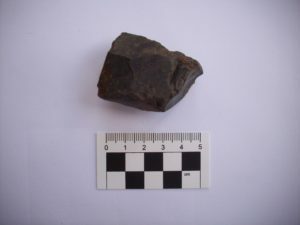 Underneath the stone feature was a thick layer of black soil (Context 4) containing little in the way of finds other than pieces of chert and quartz. 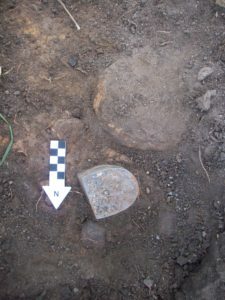 The layer of black soil was removed to reveal the cobbled surface. The cobbles seem to be made up of rounded pebbles and form a solid surface. The heel of a boot was found on top of the cobbles. This does not seem to explain the metal detector’s signal in this area. The cobbled area in this part of the trench will be cleaned and recorded before a section is lifted. 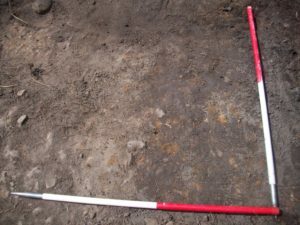 Trench 3 (2mx3m) was opened adjoining Trench 2. This trench has been opened to investigate the nature of the bank. The excavation quickly came down onto Context 2. This is similar to the yellow clay layer found in Trench 1. The bank is not parallel to the bank in Trench 2. It seems to be reinforced with stones. A large chert core was found in the top of the bank. There were also smaller pieces of chert and small pieces of quartz.